Bronze Age ritual human sacrifice may have been rarer than believed, according to a unique study of ancient DNA from bones in central Europe. German anthropologist Dr Susanne Hummel from the University of Göttingen presented her team's research at a recent ancient DNA conference in Brisbane, Australia. Hummel said the research was also the first to use ancient DNA to complete a family tree from human prehistoric remains. The researchers have been looking at 3000-year old human bones from the remains of about 40 people found in the Lichtenstein cave, in Lower Saxony, north-western Germany. 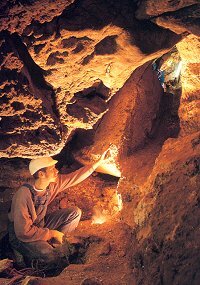 The cave was discovered in the 1980s and is one of a few sites in central Europe where human Bronze Age bones have been found. Bronze Age humans were most likely to cremate their dead, which left little in the way of bones. But Hummel said the presence of bones in this and other caves led archaeologists to conclude that these were sites of ritual human sacrifice. Cut marks on the skulls and upper and lower limb bones found at the sites supported their conclusion. "In the beginning it was thought [the Lichtenstein cave] was another site of human sacrifice," Hummel told ABC Science Online. "They thought living people had been led into the cave and killed there somehow." But Hummel and team analysed the bones and found no signs of violence. She also found the age of death, indicated by the bones, did not fit the expected pattern for human sacrifice. "Usually just one gender and one age class, let's say all juvenile girls, are sacrificed, because they are the most valuable persons to the society," she said. "[But] we found that we had all age classes. We had the baby, we had the young people, the young adults, older adults and people who were really old, like 70 years old." 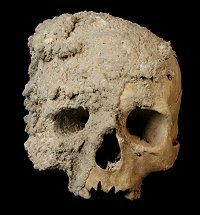 To settle the question of whether this site was indeed a burial site rather than a site of ritual sacrifice, the researchers analysed DNA from the leg bones to see if the people they once belonged to were related. "If they formed a family clan then it is absolutely unlikely this was a sacrificial site," Hummel said. She and her team extracted DNA and analysed the genetic fingerprints, patterns on the Y-chromosomes and mitochondrial DNA to establish who was related. To their excitement the researchers found a family tree complete with fathers, mothers, children and grandparents. "It was fascinating to think that you have just these tiny bone pieces and you can tell who is mum, who's dad and who are the kids, 3000 years ago," said Hummel, adding this was the first prehistoric family tree to have been identified. Hummel and team have found four generations so far and expect to find a fifth by the time they complete their analysis. "This tells us [the cave] is certainly not a place of sacrifice but that it's a burial site," she said. Hummel added other sites thought to be sites of sacrifice may also be burial sites instead, especially as most of them contain bones without cut marks. "Up to now, one never thought there was an alternative burial practice. One always thought it was exclusively cremation and everything else was some ritualised sacrificial thing," she said. "This idea might fall down." If Hummel can reproduce her findings in one or two other caves then she says it would provide good evidence that burying bodies without cremation was simply an alternative, albeit less common, method of disposing of the dead. And that human sacrifice was not as frequent as previously thought in Bronze Age central Europe. Hummel and team's molecular analysis was made possible because the DNA on the bones was so well preserved. One reason for this was the low temperatures inside the cave and the fact that the cave had been undisturbed since the time of the burials, she said. The cave is 140 metres long but is very narrow with a very low ceiling often requiring people to move around in a crouched position. "What is for sure is that during the last 3000 years nobody went into the cave," she said. Hummel said support for this comes from the fact that all the bones and bronze and ceramic artefacts found with them had been covered by a brittle layer of gypsum sinter, a special type of calcium phosphate from saturated water that dripped from the cave. Any intrusions into the cave would have been recorded in this layer, which appeared to be unbroken. Hummel said that the analysis of ancient DNA has opened a new window on prehistoric societies, shedding light on everything from hair and skin colour to the cause of death, marriage patterns and related matters of kinship. "We now have a very strong tool which can tell us how people were related to each other which is the most important thing which characterises a society," she said. Best Books on the Nordic Bronze Age and Pre-Roman Iron Age?